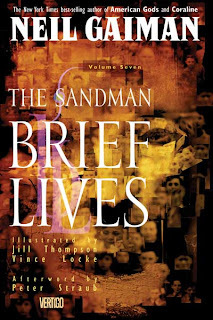 It's been quite a while since I read a book in the Sandman series, but even so, I was sucked right back into the surreal world of Dream, Death, Delirium and their other Endless siblings. I tend to eke out the series I love as much as possible because I'm always sad when they end, and there is no more discovery, just rereading. There's a fine line that I tend to walk with my favorite series, between letting things go for too long so that the story threads grow misty in my memory, and reading through too quickly to really savor each one. As usual, I advise anyone who is interested in this complex, fascinating series that runs that gamut from fantasy to horror, to read the first book first (which collects the individual comics that were first published), Preludes & Nocturnes. Start with that one and read the rest of the series in order or risk being lost and confused. Don't say I didn't warn you. This seventh volume (only three to go! Sigh.) focuses on Delirium, an Endless that hasn't had a whole lot of screen time so far. She is a fascinating character: fickle, sweet, immoral, enthusiastic, confused - very much the embodiment of delirium. Learning about her earlier incarnation imbued the story with a sense of loss that was always present as the plot unfolded. At any rate, one of the Endless, Destruction, abdicated his role years earlier, and has effectively disappeared. He was Delirium's favorite, and she misses him dreadfully - so dreadfully that she's going through a self-destructive downward spiral. She turns to Dream for help in finding him, and their journey to discover the whereabouts of their missing brother becomes a metaphoric journey that ties together many previous plot strands and elements touched upon in earlier books. The artwork is among my favorite in the series so far (there are many artists who have done illustrations for the various stories, but the writing is all by Gaiman), and it skillfully evokes the bizarre, surreal feeling of the story that's being told. I enjoyed the more cohesive feeling of this installment, as well as the way the story reveals so many new things about the various characters, things that make events from previous stories much clearer. I continue to enjoy the creative and surprising storytelling of Sandman, and I look forward to continuing the series - but not too soon. I'll be so sorry when it's over! Bibliofreak Blog: "Wow. 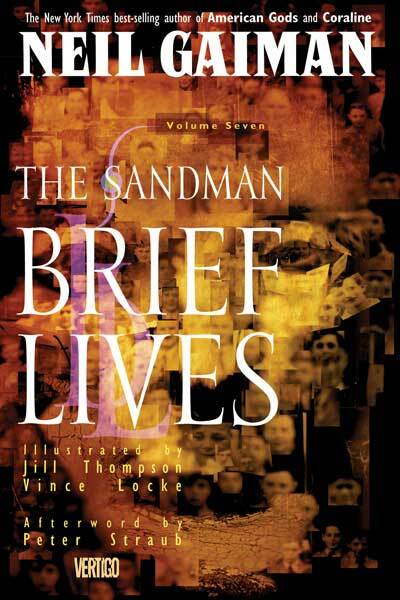 This volume of The Sandman is so full of awesomeness. It has got to be my favorite of the series so far." Pat's Fantasy Hotlist: "In the past, I have complained that the plotlines are often all over the place, without any sort of continuity, that many of the stories appear to be vignettes that have little or nothing to do with one another. Yet the great thing about this story arc is that it does tie a lot of what seemed to be loose ends together." Stella Matutina: "It’s a culmination; the point at which everything that happened in the last six volumes, every little way that Dream changed, every small hint, comes together." I really need to get around to this series. I only read the first book and that was ages ago. This is close to being my favorite if not my actual favorite. I always love Dream and Delirium together, and they're so sweet in Brief Lives. I get choked up every time I read the part where Destiny is being a jerk to Dream and Delirium pulls herself together to defend him. Awwww. Kailana - I did the same thing. I read the first one and just never really continued the series. I liked it and everything, but for whatever reason I stopped there. I'm so glad I reread and continued, because they just get better and better as you go along, and the the whole thing is made up of various stories that turn out to be all interconnected. It's really good. Jenny - This is one of my favorites as well. And I completely agree - it is so bittersweet in places, and Delirium and Dream are great together. I can tell now that I will really enjoy going back and rereading the series, knowing what I know after reading them all. So I guess it won't be so bad when I'm finally finished with it!